Artisan Themes is not only a theme shop, but also a community of great people doing inspiring stuff. We love bringing our themes’ users to the front page to show how they do what they do, and learn from them too. In this Artisan Story we interviewed Fiona & Randy Woods: An exuberant couple who have embarked on an epic adventure by boat, and at the same time on their first blogging adventure. 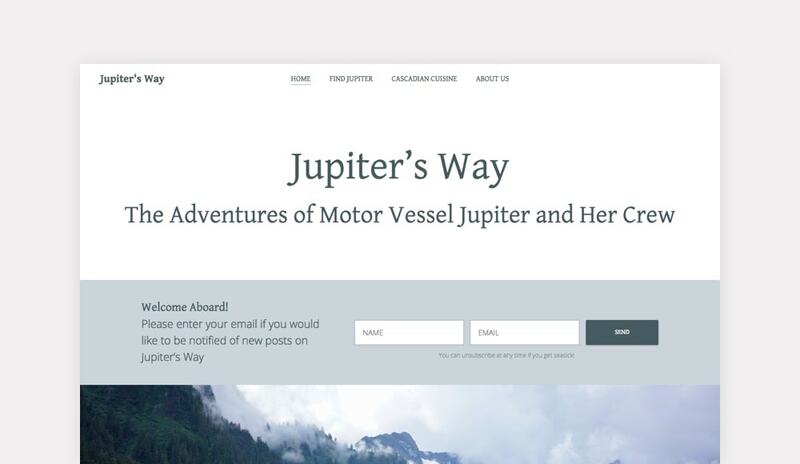 Through their website they explore ways to share their remarkable experiences at sea. Tell us a bit about yourself: where are you from, where do you live in, what do you do for a living or in your spare time? We are a couple with diverse interests, four children and two grandchildren. Our primary business has been real estate investments. In addition, we have been engaged as commercial balloonists, lived off and on for twenty years on a remote island in the Caribbean, and rebuilt an abandoned silver mining camp high in the Rocky Mountains. We love remote and beautiful places. We have been cruising aboard boats for 15 years, first along the Atlantic coast from Nova Scotia to the Bahamas and now in the Pacific Northwest. Fiona was born and raised in the north of England and met Randy when she came to the United States for a summer at the Aspen Music Festival. That was a long time ago. What do you love about the things you do? We love to explore, meet new people, see new things, taste new tastes. The thrill for us in that is reaching new understanding about the places and ways in which other people live. Having a boat is a wonderful way for us to explore because you carry a simplified version of your world with you as you move from place to place, thus providing for all your own comforts of home while stretching the boundaries of your experience. For us boating is also a very interesting and engaging platform because it requires constant attention and stretches our mechanical and navigational skills as well as our geographic boundaries. And it is fun! What made you decide you needed a website? We didn’t need to have a website at all, but we chose to have one so that we could share this latest adventure with friends in a way that felt to us to be accessible to them without forcing it upon them. It’s like setting up a display of something that fascinates you that others can stop to look at or just walk right by. We don’t mind if it isn’t interesting to them, but we try to present the information in a way that makes it compelling. It is also allowing us to hone our photography skills, writing skills and our attempts at very dry wit. Can you tell us why did you choose to go with an Artisan theme? 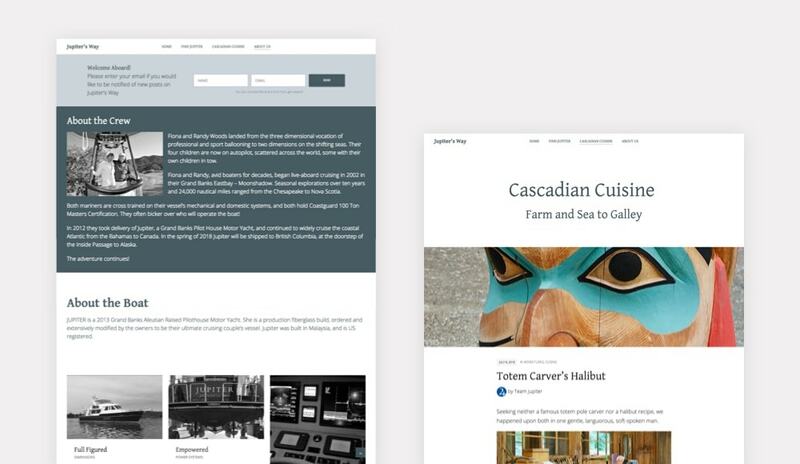 I chose Artisan Themes after considerable research, especially the cross referencing of multiple online lists about 10 best ways to build a website, 60 best blog platforms and 847 best themes for blogs. To be honest I didn’t know what a theme was when I started this project. At each place the lists intersected I looked at the website of the theme or themes that I liked. I was drawn to the simplicity of the Artisan Themes website in part because it didn’t have very many themes (although now I know they are endless in the heads and hands of humans), in part because each theme was made of building blocks (I love LEGO), and in part because they had prebuilt sites which, at the time, given my state of decision fatigue, seemed like a splendid plan. I shot off a quick question in a chat box on the site and got an almost instantaneous and very positive response from Javier. I couldn’t believe it! Too good to be true. So, I shut down my weary computer and went to bed. By morning it just seemed like the right way to go. Which was the most challenging part about building your site? Knowing absolutely nothing about how to build a site was certainly my greatest challenge, and the learning curve was as steep as a mountain in Alaska. Javier taught me to use the Artisan Themes Knowledge Base (teach a man to fish) and the Support Forums. Any time I had previously interacted with a Support Forum it was a thankless and bottomless pit of useless non-answers, but he assured me that he and Mai would have my back. They did. I watched the Webinars, not having the confidence to participate, and learned a lot about the building process. I learned I could have participated. Mai helped me reach some design decisions and eventually, like a three-legged stool at milking time we got her done. I was definitely the short leg, the one that made the whole stool wobbly, but with only two, it wouldn’t have been a stool at all and Bessie would still be bellowing. How was the experience of working with the theme on your site? Did the theme facilitate the process in any specific way? 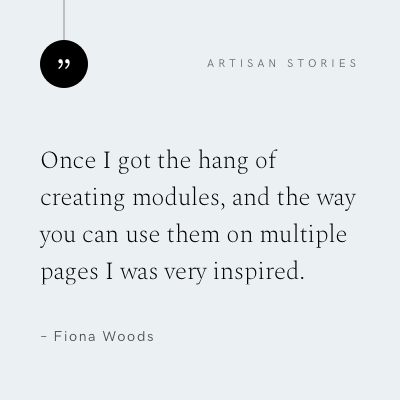 Once I got the hang of creating modules, and the way you can use them on multiple pages I was very inspired. As I started looking through Module options I came up with a strategy for laying out the pages of the website. My proudest moment was using the TEAM module to show the features of our vessel as though she was a human – sometimes she feels like one to us and I wanted to portray that. Although I have never been on a dating website (remember I met my husband a long time ago!) I wanted to imagine the boat as a potential date, touting all her best assets. Do you think there’s a difference in owning your own space in the web versus posting on social media? Not being big fans of social media, (in part due to having nurtured teenagers who were each, at some point, subject to its cruel vagaries) we feel very differently about having a blog than using social media. With our blog we feel a sense of control. For example, there are no ads on our site. In part this is a luxury of not selling anything, so we don’t need to drive traffic to our site (although it is nice to have followers). There is nothing monetized about our site which gives us the absolute freedom to do and say whatever we wish. What can you recommend to someone starting a website? Any tools or tricks you wouldn’t want them to miss? 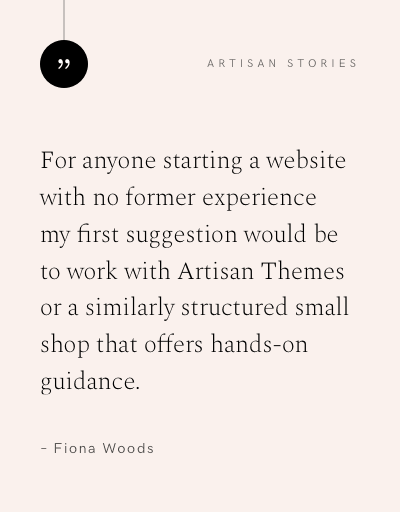 For anyone starting a website with no former experience my first suggestion would be to work with Artisan Themes or a similarly structured small shop that offers hands-on guidance. It really has a very personal and supportive feel. Javier and Mai are head doctors as well as tech / design geniuses. Whenever I would feel the creep of despair, or frustration flapping in the cyber breeze they were there to assure me that I could do this! And I could. How can people find more about you? Anyone who is interested in following our adventures by boat in the Pacific Northwest is welcome to follow our blog at www.jupitersway.com. We love questions about our boating life or the places we visit. Just as no question about building your website is too foolish for Javier and Mai to take seriously, no question is too small to ask us. Like Artisan Themes, we will answer them personally and as soon as connectivity allows. We are trying to write our blog for boating friends and for people who have no experience whatsoever of boating, just as I had none of building a website. Note from the editor: I (Javier) find myself coming to Fiona and Randy’s website weekly to find out where they’ve been. For all of you who love to travel but don’t have the fortune of doing so everyday, don’t skip their blog. You’ll enjoy every bit of it.